Head of Roscosmos Dmitry Rogozin urges haste in the development of the nation’s next-generation manned spacecraft known as “Federation”. He expects all hands on deck to build the vehicle in the shortest possible time. Rogozin made his remarks on the development of Federation on Wednesday, July 18. He noted that the first spacecraft should be manufactured within shortest time. This is needed to correlate the works with the development of Russia’s new medium-capacity Soyuz 5 launch vehicle that is planned to carry Federation into space. "We plan that this spacecraft will be built within the shortest possible period of time. We will pool all our efforts, including the technical client department, which will control the work of Energia Rocket and Space Corporation on this project. We plan that the first trials of this spaceship will be carried out when launches of Soyuz 5 carrier rockets begin from Baikonur under the Baiterek project," Rogozin said. RKK Energia, the manufacturer of Federation, aims to complete the construction of the first spacecraft by 2021. The first unmanned flight of the spacecraft should take place in 2022, followed by a crewed flight to Earth orbit two years after that. First crew for the manned flight could be selected as early as the second half of 2018. Meanwhile, first test launches of the 160-feet tall Soyuz 5 are planned to be conducted in 2022. The two-stage rocket in its heaviest variant should be capable of delivering up to 25 metric tons to low-Earth orbit (LEO). Although Rogozin’s latest remarks seem to prove that Roscosmos is on track to build the Federation spacecraft within three years from now, there were recently some reports that the project is facing delays and the spacecraft’s first test flights might be postponed to 2025. 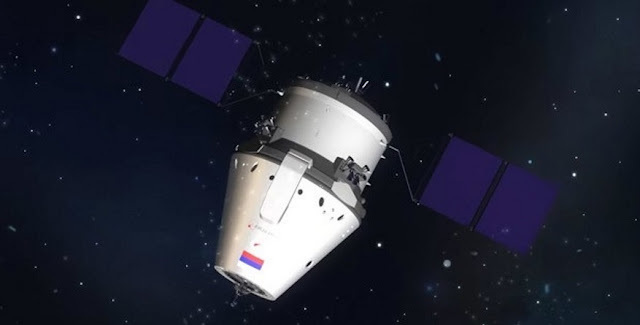 Federation, which is slated to replace the country’s flagship Soyuz vessel, would measure some 20 feet (6.1 meters) in length and have a mass of approximately 14.4 metric tons. The spacecraft is being developed to be capable of delivering people (up to four cosmonauts) and cargo to the Moon as well as to space stations positioned in LEO. It could also be able to operate autonomously for a period of up to 30 days, with the possibility of staying attached to the International Space Station (ISS) for up to a year.